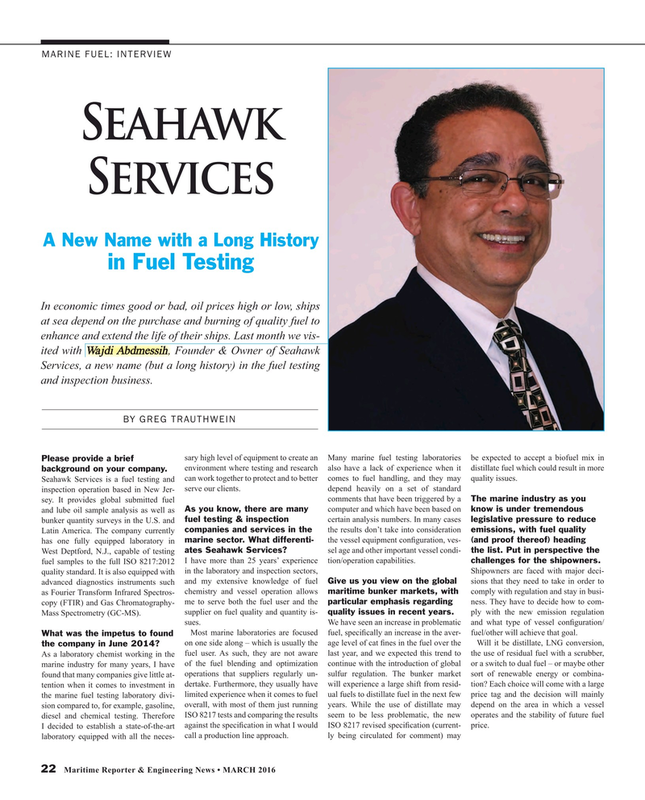 Services, a new name (but a long history) in the fuel testing and inspection business. Please provide a brief environment where testing and research also have a lack of experience when it distillate fuel which could result in more background on your company. Seahawk Services is a fuel testing and can work together to protect and to better comes to fuel handling, and they may quality issues. West Deptford, N.J., capable of testing ates Seahawk Services? sel age and other important vessel condi- the list. Put in perspective the fuel samples to the full ISO 8217:2012 I have more than 25 years’ experience tion/operation capabilities. challenges for the shipowners. Most marine laboratories are focused fuel, speci? cally an increase in the aver- fuel/other will achieve that goal. What was the impetus to found on one side along – which is usually the age level of cat ? nes in the fuel over the Will it be distillate, LNG conversion, the company in June 2014? I decided to establish a state-of-the-art against the speci? cation in what I would ISO 8217 revised speci? cation (current- price.